The Fort Williams Cemetery site was located in Talladega County on a elevated rise on the east side of the Coosa River. The military road to Talladega passed to the north of the cemetery and continued in a northeasterly direction toward its final destination, Talladega . The fort which bore the same name, Fort Williams, lay to the west of the cemetery on a hill. Years earlier, Jackson's men had transported supplies down the Coosa and hauled them from the water's edge up the hill which lay in front of the fort. After the construction of Lay dam on the Coosa in 1914, the ruins of fort were noted by a passing traveler who wondered how much longer the weathered remains of the old fort would stand there overlooking the Coosa. Incredibly, the fort did not surrender to the elements until after 1928 when the dam on the Coosa was raised and the old fort fell into the Coosa. This, however, did not occur until the fort had endured several weeks of the water lapping at its foundation.
. An effort to get the U.S. Congress to extend protection to the Fort Williams Cemetery site died in the House of Representatives after the U.S. Senate had passed senate bill S2595. More information regarding senate bill S2595 and the correspnding house bill H.R. 7271 can be found in the Congressional Record: Index to the Proceedings and Debates of the Second Session of the Seventy-First Congress, December 2nd to July 3, 1930. These records were made available by Mr. Billy L. Atkinson, the Judge of Probate of Talladega County. 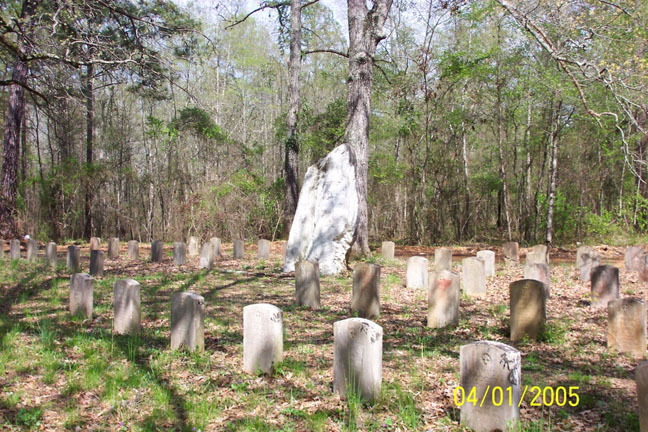 The Fort Williams Cemetery site was recognized as a cemetery and accorded tax exempt status by Talladega County. The problem, however, during the decade of the 1930 was money. The Fort Williams Cemetery was removed in 2006 and the cemetery site and the adjacent area renamed "Riverbend". It is now being developed as part of a River Community on the Coosa River. The monument and markers were relocated at the same time and placed within the Riverbend Development in what the Riverbend Group refers to as a "Memorial Garden." The term "monumental" has also been used to describe the new site to which the markers and monument were taken.There is no record of any human remains having been moved. Fort Williams, located at the mouth of Cedar Creek and the Coosa River in what is now Talladega County, Alabama was constructed in 1814 to serve as a supply depot preparatory to the Battle of Horseshoe Bend on March 27, 1814. After this battle, Jackson returned to Fort Williams. The cemetery at Fort Williams became the final resting place of more than a hundred Tennessee militia and others. These others include Cherokee allies who fought with Jackson at the Battle of Horseshoe Bend, but who were buried apart from Tennessee militia and Creek Indians who were forced to come Fort Williams in 1832. For more information on these individuals, see Creek Indian Removal, the Creek Trail of Tears. More than 3,000 Creek were collected at Fort Williams in 1832 and many died there because the fort's commissary lacked adequate provisions. [Born 1784, died Apr 20, 1814 Ft. Williams Talladega County] was among the first to be buried at Fort Williams. Many of those buried at Fort Williams were members of the 39th Regiment US Army. be preserved at the Hermitage. 46. Harden, William P. Pvt. 47. Weddle, Elias was born Apr 16, 1770 in Holland, he died on Mar 27, 1814 at Horseshoe Bend 2nd Lt.
48. King, Edward 1st Lt.
55. Johnson, Thomas J. 1st Lt.
58. Crumley, Jacob, Sr. Pvt. near there, at the National Cemetery (from Soldiers of Maury County, Tennessee). Estes, Gallant. He was born 1780, buried Fort Williams Cemetery. He was with his son Edward (son from his first wife) at the Battle of Eufaula in Alabama as a private in the Company of Tennessee Volunteers Mounted Gunmen commanded by Captain Adam Dale, 2nd Regiment commanded by Col William Y. Higgins under the command of General Andrew Jackson, fighting the Creek Indians. He was shot through the head on the morning of January 22, 1814 and died four days later on Jan 26, 1814. Fancher, Job. born ca. 1780 and died 1814 at Fort Williams, Talladega County. Hudson, Charles W. born March 15, 1789 and died March 27, 1814. Buried Fort Williams Cemtery. Patton, James. Born 1784 and died March 27, 1814. Buried at Fort Williams Cemetery. Stephens, Joseph. Died on March 27, 1814 and buried at Fort Williams Cemtery. Williams, Michael. Born 1778, died October 16, 1814. Buried at Fort Williams Cemetery. .